This photo, from the Collier Collection, is reproduced by permission of the Museum of English Rural Life. It is a view of the Remount Depot, which was in Barkham despite the caption. 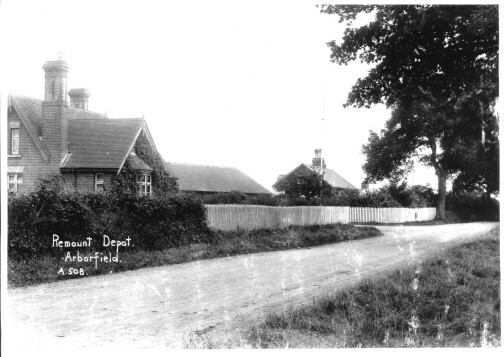 The Depot trained and cared for the horses used by the British Army, and was extremely busy during the First World War with lines of horses delivered to Wokingham Station and then led along the Barkham Road. There are still stable blocks from the old Remount Depot, though the camp was converted into Arborfield Garrison in the late 1930's.